But those years were just a pre-cursor to what became a legendary Indy and stock car racing career. Russo and Nichels ran 11 races in the 1949 AAA schedule, but had a falling out with Pritchard, beginning with the August 20th race at Springfield, Illinois, when they first spotted the new Kurtis-Kraft built Meyer & Drake No. 99 car being campaigned by Murrell Belanger. Both were convinced that the design of this car was revolutionary and pushed hard to get Pritchard to have Tuffanelli to buy it. But Pritchard failed to grasp the coming changes of Indy racecar design and wanted no part of the M&D No. 99. In less than a month, Nichels left the Tuffanelli team. It was then that Ray made up his mind that he would no longer leave his racing future in the hands of other people, especially those who lacked vision. So Ray with his buddy Russo, decided that if they couldn’t get their hands on a car like the M&D No. 99, then they would build their own. As 1950 began, Ray Nichels spent the daylight hours delivering heating oil for the Kovsi Fuel Oil Co. and Paul Russo earned his paycheck as a welder. But in the evenings, Nichels and Russo pursued their dream to race their own hand-built creation in the 34th running of the Indianapolis 500. At night, the two could be found in Paul Russo’s Harrison Street basement in Hammond. After darkness set in, they became racecar builders. Some nights they were mechanics. Some nights they were engineers. Some of those nights they were chassis men. But every night, they were racers! They started the project constructing the frame, thinking that if they could get it built, they might be able to lease an Offy engine on a percentage basis once they got to Indy. Tools for the project were simple. For a layout table, they used the floor. For a blueprint, they used a large piece of cardboard with the plans drawn in pencil. When they needed to come up with alternate sketches, they used the floor and the walls. For a straightedge, they used the lid of a suit box. For a band saw, they used a hacksaw (and promptly went through 64 hacksaw blades cutting the frame.) Necessity was truly the mother of invention. When it was finished, the Russo-Nichels Special had to be completely dismantled before it could make its journey to see sunlight. Then it was on to Indianapolis. Once they got to the Speedway there were no garages left for them to house their car, so they set up operation in a small tin shed with a cinder floor near the Marquette Welding Shop and readied themselves to qualify. Shaw gave the Russo-Nichels Special a long gaze, seeing no front grill, a temporary fuel tank and not a drop of paint anywhere. He paused and then said, “You don’t have a number. You can’t qualify without a number.” Nichels and Russo looked at each other for the longest moment and said, “Wilbur, we’re broke. We don’t have a buck between us. We can’t afford to have a number painted on the car in time to make the race.” In the true Hoosier spirit that is the Indianapolis 500, Wilbur Shaw said, “You boys qualify … then you get a number painted on this car right away and send me the bill.” That very afternoon the boys qualified for the most prestigious auto race in the world. Starting in the seventh row the Russo-Nichels Special went on to capture the imagination of the American racing public by running with the leaders for much of the day, before the rain-shortened Indy 500 ended at 345 miles. 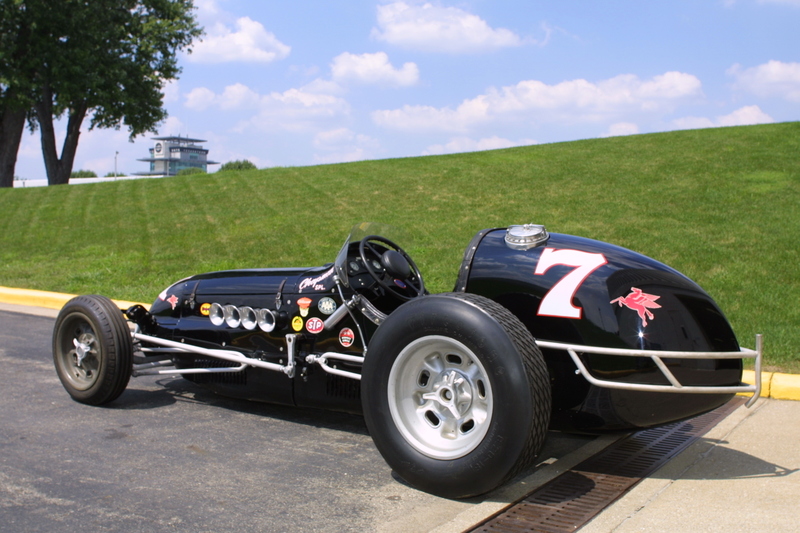 The Russo-Nichels Special soon became affectionately known as “Basement Bessie” as it was campaigned on the AAA Championship Trail during the 1950 season, running 13 races, capturing two victories, seven top-fives and nine top-tens. In December, Nichels with defending Indianapolis 500 Champion Johnnie Parsons behind the wheel, subbing for an injured Paul Russo, won the first ever Indy car race at the newly built Darlington Raceway. Parsons and the Russo-Nichels Special put on a spectacular show for all 10,000 spectators to witness. He lapped the field, finishing the 200-mile race in an impressive one hour and 54 minutes, for an average speed of 104.651 miles per hour. One of the most incredible aspects of the 1950 season for Paul Russo and Ray Nichels was the season-long performance of their hand-built basement creation. Had Russo not been injured with in the AAA race at Phoenix finishing his season and had been the driver behind the wheel for the last three races, Paul would likely have won the AAA Indy Car National Championship. Had it not been for the need to use two other drivers to replace the injured Russo, “Basement Bessie,” would have worn the crown of a champion. Born in a Hammond, Indiana basement, the Russo-Nichels Special now rests in the Indianapolis Motor Speedway Hall-of-Fame Museum.